Today’s beautiful celebrations are properly at home on gorgeous bride Jodie and Ed’s family farm. 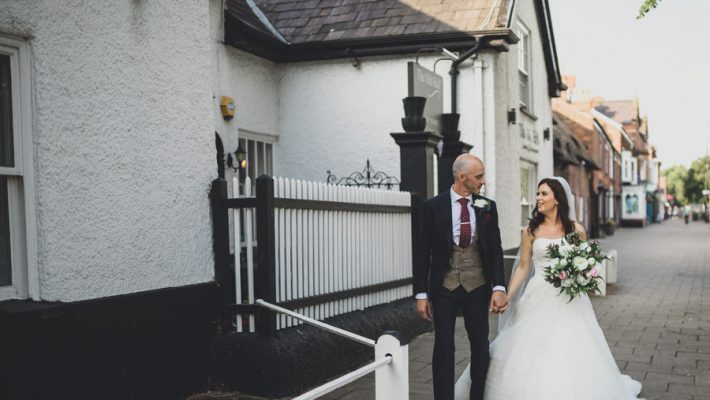 Huge thanks to English Wedding Directory member Jess Yarwood Photography for her wonderful images – Jodie describes their wedding as “the most precious love-filled day of our lives” and I think her description fits it perfectly! Our wedding followed a rustic traditional theme styled around our farming lives. From the tractor which Ed drove us home from church on to horseshoes and little sheep on every table and straw bales scattered everywhere we made the theme about us and our lives. There were abundance of pink and white flowers, greenery, and cut logs inside and outside the marquee. My advice for other couples? Enjoy the wedding planning – it really is a long process not to, and don’t get yourself worried or upset over things you can’t afford or couldn’t have. Your wedding will be the best day of your life no matter what, where and how it happens! Being married has made me happier than I have ever have felt before. I get to spend the rest of my life with my best friend and that is such as amazing feeling to have. We were recommended Jess through the florist who was working on our wedding. We had a particular style of photography we knew we wanted and Jess offered just that. We were so impressed with Jess in every aspect. We wanted an informal and natural style of photography for our wedding day and that’s exactly how it was. Jess had forward planned everything to make sure she could remain discreet whilst capturing unique and absolutely stunning photographs throughout every moment of the day – photographs which we will treasure for the rest of our lives. Looking over the photos was like reliving the entire day again, it made us both really emotional. We can look at certain photos and be reminded exactly what we were thinking and feeling in that moment. We were married at St Mary’s Church in Nether Alderley and held our wedding reception at home in a marquee on our Farm in Mottram St Andrew. All our supplies came from word of mouth recommendations. We found that once you had met one person or company you really liked they could then recommend other local suppliers who they like to work with to cover other aspects of the day. Our marquee, caterering and bar companies all had previously worked together which meant they could directly contact each other without having to involve us every time – this saved a lot of stress and time! We saved a great deal of money by ordering our stationary as a printable document which we could then take to the local printers and print of ourselves. This was by no means a compromise as the stationary was beautiful and received many compliments. We also made signs and dressed the marquee using things we had around the farm. We even had two spare sofas we used which perfectly matched the decor and saved hiring additional seating from the marquee company. We decided not to give wedding favours as we didn’t feel the additional money spent here would particularly enhance the experience of our guests and we also saved a great deal of money by not hiring cars. We asked a large favour of a local tractor dealership and they leant us a brand new tractor for the day so my dress would stay clean!! It was a fantastic talking point and brought something different to our wedding while costing nothing. Think about who you know and what they may have to offer there’s so many alternative options out there. We sourced the majority of the stationary from a lady on Etsy. With our input she designed the invitations, menus, name settings, order of service and thank you cards in a printable document. We then sent these to our local printers for printing. I made the table numbers and seating plan myself along with some other bits using materials from around the farm and we recruited Eds Grandad and his exceptional caligraphy skills for all the handwritten work. I purchased a Mori Lee dress from Maria Modes in Macclesfield, Cheshire. I then took the dress to Boutique Alterations in Bramhall to make it the perfect fit. I kept my accessories fairly minimal. I bought some beautiful hair pins to place above my veil, small diamond stud earrings and gorgeous embellished heeled sandals which were my first wedding purchase. I also bought a diamante belt to wear in the evening of the reception to slightly change my look. Admittedly I bought a spare pair of comfy wedges to wear when my feet got sore, i’m really glad I did this otherwise I would of ended up in a pair of flip flops. Ed wore a light navy lounge suit with a tweed waistcoat and rose pink tie. He hired his suit from Maria Modes but bought his shirt, shoes and accessories. The bridesmaids wore embellished rose pink floor length dresses. I bought them from ASOS and had a seemstress make small alterations to the length. I searched high and low at bridesmaids designers and found nothing the girls and myself preferred over their ASOS buy. They were perfect. I choose to hire two separate ladies to come and do our hair and makeup. Again these two ladies work together a lot and came recommending each other, this made trials and the morning of the wedding a lovely friendly atmosphere and they both got really involved with the excitement of the morning. My hair stayed put and my makeup didn’t budge all day. My wedding flowers were arranged by a friend who owns Fresh Floral Design, Hartford. Luckily I have the chance of working with Caroline regularly so I get to see lots of beautiful weddings she does which made coming to design our wedding flowers fairly straight forwards. We had lots of greenery in our arrangements, mixed with an array of pink and white flowers. We had two hanging displays of flowers from the ceiling of the marquee, milk churns full of flowers and a raised wall of flowers in the church – these were a beautiful touch. In addition to the table centrepieces our venue dresser added urns of trailing flowers to each corner of the marquee, lanterns, blossom trees and light up love letters near the dance floor. Outside we built sofas from straw and made seats around the pond from fallen tree trunks on the farm. A local farm shop leant us many potted large pots of pink and white plants to decorate the field. We made our own fire pit using a disused diesel drum which we carved the letters J & E in to so when lit it glowed with our initials. We also made a huge bride and groom from hay bales at the top of the drive which had great comical value for everyone driving by but also helped our guests to find their way to the reception. As I surprise for Ed I had printed many photos of us throughout the years and pinned them to a pallet which I lit with fairy lights. I really enjoyed making that. We choose a three tier buttercream cake with a rough hand finish to the outside. We wanted a natural looking cake that didn’t look over thought through and that is exactly how Bloomsbury Wedding cakes made it. We choose our three favourite flavours following a tasting and design session which was great fun. For the guest arrival and church ceremony we had a Violinist perform which created such a romantic feel and gave our guests some entertainment while arriving at church. The Bourbon Street band were a massive hit in the evening reception, they also performed our first dance song and made it their own which was an amazing unique touch to us.